Conflict resolution becomes necessary when resource area priorities conflict. Confrontation polarizes the parties that need to sit down together, to find resolution. Safe Harbor researches the conflict history, develops alternatives and sits down at the table with all parties. Our goal is to resolve the issue through consensus, on an environmentally sustainable solution. We encourage responsible parties to follow us along that path. When a beach front condominium association removed nearly a third of an acre of beach grass, the local Conservation Commission imposed fines and the stage was set for social and legal conflict. 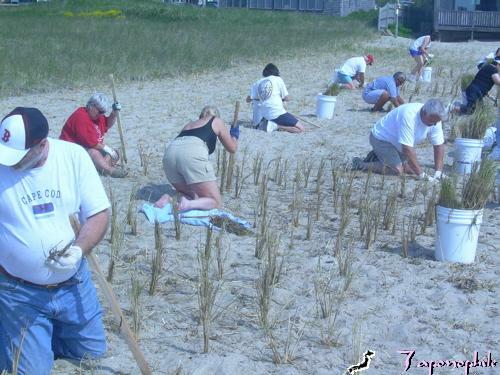 On Memorial Day weekend, when people were starting barbeques, the residents of this condominium came down to the beach with 24 thousand stems of beach grass. Safe Harbor encouraged the condominium owners to consider a unique proposal. Instead of spending thousands of dollars on legal fees or hiring us to replant the grass, Safe Harbor would provide the grass at cost from our supplier and we would teach the condominium owners how to plant the grass themselves. The condominium association accepted our unusual suggestion, which also saved them thousands of dollars in planting costs and legal fees. Gordon Peabody of Safe Harbor, demonstrates his preferred â€œlow techâ€ method of using a wooden stake to create a hole of the proper dimensions for planting grass. 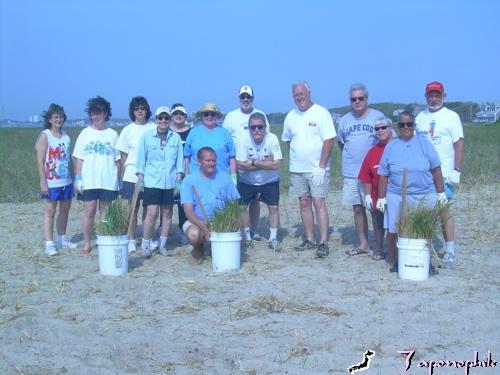 These condominium owners set a leadership example for protecting our coastal resources. They have received Safe Harbor's OCEAN (Outer Cape Environmental Awareness Newsletter) Environmental Initiative Award. A commercial property had fill delivered to increase a parking area. A small, seasonal wetland at the bottom of the slope might have been too small to qualify for protection under the Wetlands Protection Act. However since there was no request made of the Conservation Commission to review the project, enforcement activity was initiated by the Commission Agent. A close look at the restoration area provides insight into the contribution of sub-habitats (or micro habitats) to biodiversity. Safe Harbor integrates micro habitat concepts in our restoration work. Mediation meetings took longer than it did for this area to revegetate. We believe the resource area stewardship should never be left behind in conflict mediation work. The features that distinguish the three categories can be placed on a continuum. These are illustrated in the figure below and the end points of the continuum are explained in more detail in the following text. Instrumental verses communicative rationality Instrumental rationality is about taking the most logical path for achieving a particular objective - put simply it is about arriving at the â€˜best means to an endâ€™. In contrast, communicative rationality is about making the best choice. Decisions are made by participants mutually adjusting their positions through a process of reason, argument and deliberation (Dryzek 1990). Consumer verses social preferences A consumer is an individual who is only interested in entities or acts that directly or indirectly influence their utility, and who is rational in the sense of making consistent choices to maximise their personal utility. Sagoff (1988) has argued that in the face of hard decisions, individuals act as citizens rather than consumers. He states, As a citizen, I am concerned with the public interest, rather than my own interest; with the good of the community rather than simply the well-being of my family. Optimal verses compromised outcomes The principle of optimisation originates in physics and centres on the notion that the best or optimal outcome is one that maximises the performance of a particular variable in a mathematical function. The principle is most commonly applied in decision-making to maximise profits or utility. Roy (1987) strongly argues against a â€˜single criterionâ€™ approach fostering the idea that real life decisions are a compromise between multiple and often conflicting criteria. In all cases, the definitions have a degree of fuzziness or overlap. Therefore, a specific decision tool may display varying degrees of each distinguishing feature, thus making it more or less applicable to solving a particular problem. This will be an important consideration in the final selection of a decision tool for the SIF. Figure 2. Classification scheme for decision tools applicable to NRM. The decision tools listed above can be used in various ways to facilitate decision making. In light of the SIF and the project brief, we need to evaluate them in light of their capacity for prioritisation. A priority can be defined as a main concern, one that takes precedence over lesser concerns. The outcome of prioritisation would be some form of ranking, from highest to lowest concern. Prioritisation must have a context. For instance, a ranking of asset values may differ from a ranking of assets which also takes into consideration the costs of protecting them. For the SIF, the central concern is achieving the highest public benefit on public investment. o Economic tools - priority expressed via monetary values. o Multiple criteria tools - priority expressed via weighted criteria. o Deliberative tools - priority expressed via participant consensus on ranked options. There is no requirement that values to be quantifiable or measurable. However, if values can be measured they are easier to compare with each other. The central premise underlying economic tools is that costs and benefits of actions can be aggregated using monetary weights. The tool has a strong basis within a welfare-theoretic framework, and provides a very rigorous check on the economic efficiency of policy: it is difficult to argue for an intervention where costs exceed benefits (although one can argue about the measurement of benefits, see discussion below). An individual project or treatment can the be evaluated on the basis of whether the benefits exceed costs or whether the internal rate of return generated by the investment exceeds some critical value (ie. this measure is used where the costs and benefits are distributed over time). If one requires a prioritisation process of projects to achieve a particular outcome then a comparison of cost benefit ratios or internal rates of return across a number of projects provides a mechanism for identifying the best portfolio of projects to undertake: if funds are limited then it may be the case that at the margin some high-return projects are not funded. This could be used as an argument for increasing the funding made available at the margin. The central challenge for cost benefit analysis is to identify the full range of costs and benefits, to identify their distribution through time and to obtain monetary values for them. Where there are market goods involved then one can use those market values, although this cannot be done without some consideration of whether the market prices are themselves appropriate. It is often the case that markets are distorted for some reason, and those market prices do not reflect the true social values of the resource. In this case one has to identify the opportunity cost of those resources. Of greater concern are those non-market outcomes, which are likely to be in the majority in the case of public investment in natural resource management. In that case monetary valuation techniques require the use of non-market valuation techniques in order to identify those values. There are a vast number of these available (contingent valuation, conjoint analysis, travel cost techniques etc) but the effectiveness of them is not beyond dispute, and it is often the case that the resources or time are not available to apply the approach to all possible impacts under consideration. Instead, benefit transfer may have to be employed, which means that values associated with similar resources that have been studied are transferred to those under consideration. This all raises the question of whether the values are sufficiently precise for them to be of use within the cost benefit analysis framework. An alternative to cost benefit analysis is cost effectiveness analysis, where the costs of alternative ways of achieving the same objective (or level of output) are compared. Cost effectiveness avoids the need to place dollar values on outcomes, as long as some single (cardinal) measurable index of outcome can be generated. It considers the gains and losses to all members of the society on whose behalf the analysis is being undertaken. It values impacts in terms of a single, familiar measurement scale - money - and can therefore in principle show that implementing an option is worthwhile relative to doing nothing. The money values used to weight the relative importance of the different impacts are based on peopleâ€™s preferences generally using established methods of measurement. Individuals are poor judges of their gains and losses (Pearce 1983). If ecologists have difficulty in understanding the importance of various species in ecosystems, the how can consumers, aided by the market place, correctly place a value on various them (Hajkowicz 2000). The inherent technical abstraction of monetary valuation restricts debate and discussion (Spash 2000). In almost all such problems the multiplicity of criteria for judging the alternatives is pervasive. That is, for many such problems, the decision maker wants to attain more than one objective or goal in selecting the course of action while satisfying all imposed constraints (Hwang and Masud 1979). Multiple criteria tools establish preferences between options by reference to an explicit set of objectives that the decision making body has identified, and for which it has established measurable criteria to assess the extent to which the objectives have been achieved (Department for Transport, Local Government and the Regions 2001). There are two major aspects for choosing a specific criterion: 1) the criterion is an important point of view, and 2) the criterion differentiates the alternatives. For example, if species diversity is considered to be a very important criterion, but all alternatives turn out to generate the same diversity, then it is not a helpful criterion to rank the alternatives because it has no differentiation power. Multiple criteria tools could conceivably operate with the same physical and technical information set as a cost benefit analysis, but without the requirement that the outcomes are compared on the basis of some single metric, money. The weighting process represented by the monetary valuation is replaced by some other form of criteria weighting. The source of those weights, and the methodology to identify them, is the basis for the diversity of multiple criteria tools that are available. One advantage of the approach over cost benefit analysis is that once the constraint on monetary valuation is relaxed, outcomes that previously would not have been included, are. It is important to note that the concept of cost effectiveness is still important within a multiple criteria analysis: it is a basis for screening possible funding opportunities. A standard feature of multiple criteria tools is a performance matrix (also known as an effects or consequences table). In table 2 below, each column represents an option and each row describes the performance of the options against each criterion. The individual performance assessments are often numerical, but they may also be expressed in qualitative terms. The choice of objectives and criteria that any decision making group may make are open to analysis and to change if they are felt to be inappropriate. Scores and weights, when used, are also explicit and are developed according to established techniques. They can also be cross-referenced to other sources of information on relative values, and amended if necessary. Performance measurement can be sub-contracted to experts, so need not necessarily be left in the hands of the decision making body itself. It can provide an important means of communication, within the decision making body and sometimes, later, between that body and the wider community. Issue of whose objectives should be represented (Department for Transport, Local Government and the Regions 2001). This problem could be minimised by ensuring that the objectives are sufficiently wide to encompass the main concerns of people. Multiple Criteria Tools cannot show that an action adds more to welfare than it detracts (Department for Transport, Local Government and the Regions 2001). This obstacle can be overcome by including a do-nothing alternative. Multiple criteria tools provide a sound framework for complex decision making problems. They are particularly suited to NRM because the tool: (1) distinguishes a broad set of criteria used in NRM decisions, (2) can effectively identify trade-offs between conflicting objectives, and (3) deals adequately with non-monetary, qualitative and uncertain information. A multiple criteria decision tool should be applied for prioritising investment. The main criticism levelled at multiple criteria tools is the arbitrary nature of their weighting systems. A logical progression in overcoming the problem is to incorporate either economic or deliberative techniques to generate the weights. Leading researchers and practitioners in this new area should be consulted on the relative merits of deliberative multiple criteria analysis and choice-weighted multiple criteria analysis. Design is the most crucial stage in any application of the multiple criteria tool, particularly with regards to: (1) structuring of objectives, (2) setting the management alternatives, (3) determining the decision criteria, (4) filling in the performance matrix, and (5) eliciting weights. Clear guidelines should be prepared for the practical application of the multiple criteria tool. This information is included in a report issued on August 22, 2002 by J. Black and M. Burton, from the School of Agriculture and Resource Economics, Department of Natural Resources and Agricultural Science, University of Western Australia.